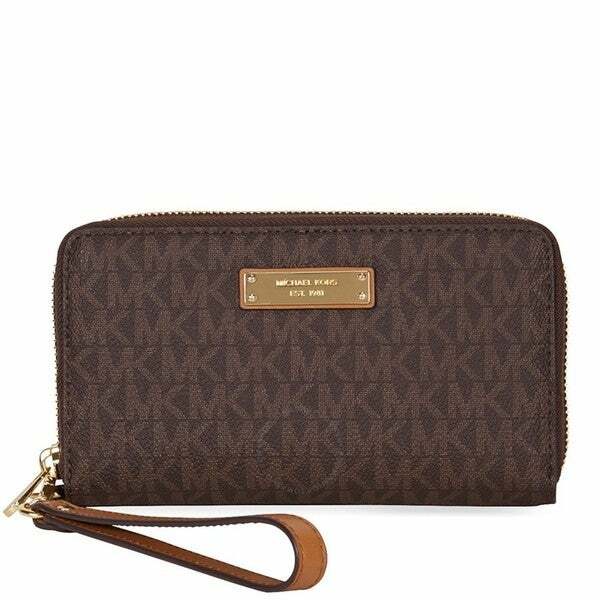 I prefer the other MK wristlet sold here, as I carry too much in my wallet. My phone and cards fit fine, but couldn't carry a lipstick too like the other MK model. Still a very nice wallet. I'll likely use when my other finally wears out. Matches the purse I bought. Shield your phone from impact-related damage, scratches, dust, or fingerprints with this Michael Kors logo-printed phone case. This case features a zippered main compartment to keep the contents secure and internal slots for cards and ID. I love everything Michael Kors and this wristlet is no different. Greatly made product and holds all my important things and my phone. With this I do not have to carry a purse. I bought my friend one for her birthday. She is a minimalist and loved the simplicity but sophistication of the wristlet. I bought one for myself, and it definitely fits my phone (iPhone x) along with essential credentials and credit cards along with a lipstick and a tile, in case it slips away from me. I purchased one of these two years ago for my wife and she absolutely loved it then she lost it so i ordered this one its not the exact one as before minus the large mk logo but she loves it the same. Great . So convenient and sturdy. I love it.